Throughout Theresa May’s visit to Saudi Arabia this week, a lot of the debate has focused on whether or not she should be there. Should the UK, many journalists wondered, be friends with a regime that arrests teenagers and threatens them with crucifixion? That has committed war crimes and left seven million people on the verge of starvation in Yemen? That doesn’t let women drive cars? Clearly not, but another question – one which has been far less explored – is why, exactly, was Theresa May in Saudi Arabia, and whose interests was she representing? In her interviews, she has talked a lot in broad terms about post-Brexit trade, but she will have had one trade in particular in mind: the arms trade. Saudi Arabia is, by far, the largest buyer of UK arms, with over £3 billion worth of fighter jets and bombs having been licensed in the last two years alone. These include the same kind of aircraft currently flying over Yemen, and the same kind of bombs that have been falling from the sky on Yemeni civilians for months. Saudi Arabia has been a long term cash-cow for UK arms companies. Last August, the share price of BAE Systems, the UK’s biggest arms company, jumped as analysts predicted the company would sell another batch of 48 Typhoon fighter jets ‘within six months’ for around £4bn. Eight months on and, despite many high-level British-Saudi meetings in the mean time, there is still no deal. In travelling to the Kingdom, May is sending a strong message of endorsement to the Saudi regime, one that Whitehall hope will be rewarded by arms sales. In this regard, May is following in the footsteps of British Prime Ministers going back as far as Thatcher. Whenever a big arms deal is up for discussion, they’re on the first flight to Riyadh. Even members of the British Royal Family are not above working for arms dealers. In February 2014, Prince Charles flew out to Riyadh, where he donned traditional Saudi robes and participated in a sword dance at a function sponsored by BAE. The following day, the company announced it had agreed a price on its sale of 72 Typhoon fighter jets to the Kingdom. So why are our politicians prepared to clock-up so many air miles for companies like BAE? It can’t all be because of jobs. After all, BAE is a multinational private company that employs far more staff abroad than in the UK. It’s often said that the arms trade is a money-spinner for the UK. It is not – it’s only a money-spinner for the arms companies’ shareholders. One reason for this is because of their slick and well-funded lobbying operations, and the way they work hand-in-glove with Whitehall. Data compiled by Campaign Against Arms Trade (CAAT) shows that the government and arms companies have hundreds and hundreds of meetings every year. While some are on operational matters, many others will be lobbying meetings. 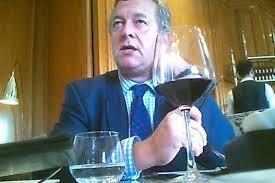 A number of senior arms company directors enjoy access to a web of high-level governmental advisory bodies. One of these, the Defence Suppliers’ Forum, brings arms company chief executives together with MoD heads, including the Defence Secretary. The arms trade even has its own department in Whitehall: the Defence & Security Organisation, which employs 130 civil servants and military personnel, with the sole purpose of selling arms. It also works with industry to organise and facilitate major arms fairs, like the annual DSEI, which will next be taking place in London this September. One symptom of the relationship is the well-worn revolving door between government and the arms trade, with many high-ranking government officials later moving into employment with arms companies. Looking to BAE, its in-house team includes Oliver Waghorn, who used to work for then defence secretary Liam Fox; Brooke Hoskins, a former private secretary to Labour business minister Stephen Byers and Chris Rees, who used to work in parliament for Mark Menzies MP. However, the issue goes way beyond the choices of a few individuals. It is systemic. Research from The Guardian found senior military officers and MoD officials had received approval for over 3,500 jobs in arms companies just for the period from 1996 to 2012. Furthermore, arms companies regularly have staff seconded to the same government departments that are responsible for buying and selling their wares. There is no doubt that the lobbyists do an effective job. Former Foreign Secretary Robin Cook characterised well BAE’s influence over Whitehall when he said “the chairman of BAE appeared to have the key to the garden door to No 10.” He added that he “never knew No 10 to come up with any decision that would be incommoding to BAE.” The personnel may have changed since then, but the relationship is the same. Two years ago, campaigners managed to obtain the guest list for an arms industry dinner in central London. All of the biggest companies were there, and so were the politicians. In total, 40 politicians made it on to the guest list, including senior ministers and reps from Conservatives, Labour and the Liberal Democrats. 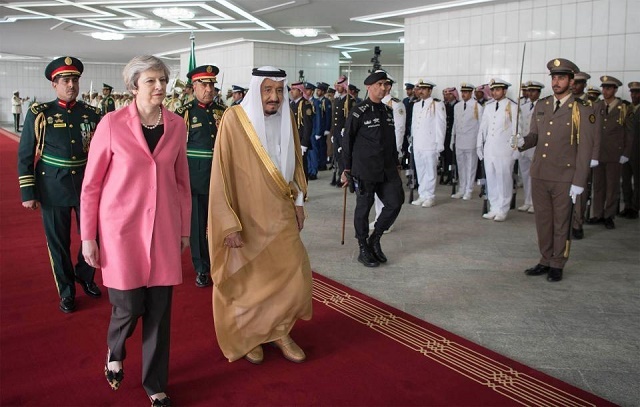 May has rightly picked-up a lot of criticism for her failure to challenge human rights abuses, and for her complicity in Saudi Arabia’s war in Yemen. But it’s always worth remembering why she is doing it, and who she is doing it for. The problem is not so much May as an individual, it is the culture and system that has allowed arms companies to gain such a major influence over UK government and policy. May claims that the goal of her foreign policy is to promote the UK’s ‘national interest’. In reality, in Saudi Arabia she is promoting one narrow interest above all others – that of the arms companies. It’s a testimony to the arms trade’s lobbying operation that she believes they are one and the same thing. As long as arms companies are influencing policy then it will be one that serves their interests, irrespective of the humanitarian consequences. See also: Special Report | DSEI 2013: Impeding the world’s biggest arms fair. Joe Lo is a spokesperson for Campaign Against Arms Trade. You can follow CAAT at @CAATuk.